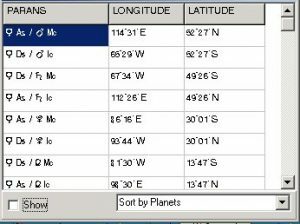 Draws all culminating, anti-culminating, setting, rising lines on the map for each planet in the chart on the screen. Draws any of the 47 types of prediction lines on the maps, such as transit, secondary, tertiary, minorprogression, profection, direction, solar arcs and converse solar arcs. All of the these can be done for direct or converse motion. You can display only the prediction planet line that you want over the natal lines. Draws lines for different techniques In seconds you can calculate and draw lines for a wide variety of different techniques, such as, Solar return, lunar return, phase return, moon phases for each month,diurnal chart, sun ingresses, moon ingresses, eclipses, and more. Recalculates local space lines from any location in the world just by clicking on the map! 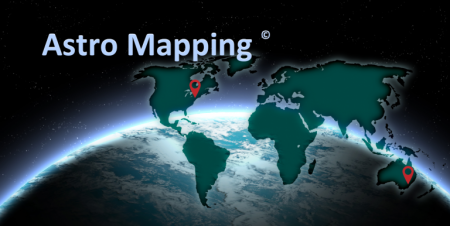 Recalculates relocation natal charts for any place in the world just by clicking on the map! YES, we calculate Eclipses and Occultation’s paths and also draw the Epicenters and place them on the map as paths or Epicenters. The shadows are also included. You can have as many as you want on one map at the same time. 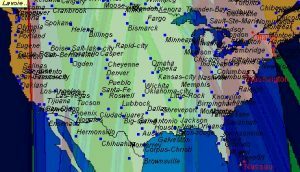 With one click of the mouse, in two seconds, you can calculate 10 solar eclipse paths and place them all on the same map. As you will see the occultation paths were very important in the tragedy of 9/11. Check our webpage for more info on this event and occultations. Screen Delineations: Our program gives you on-screen delineations that may be sent to the printer for any locality in the world. 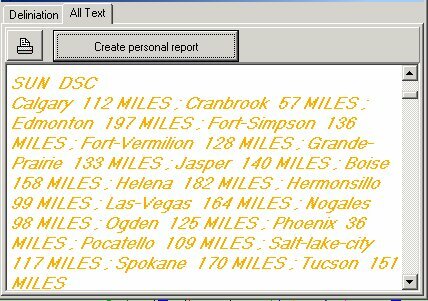 You can also prints an entire delineation report for every line and crossings on the world map. No guesswork! The reports will specify every city that every line on the world passes through within a certain radius set in miles. It displays the # of miles from that city. You may also choose to print a report for a only a specific city. Our Maps display all parans in a banner or on the map. Zoom into any portion of the map. Print the entire world map or only portions of it in beautiful colors. Add or delete any city labels to the map. Displays all parans in the banner. Zoom in on any portion of the map. Print the entire world map or selected. Add any city labels to the map. 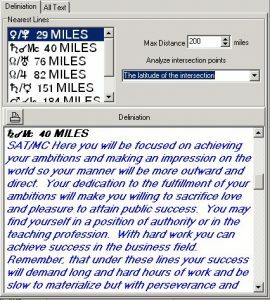 Locality Maps is a program that is unique and incredibly ahead of its time. Do you really believe that if you move under your Jupiter line you will make a fortune? What a fallacy! I researched 1,300 charts of millionaires and almost none of them made their millions on their Jupiter line. Astrological energy in the natal chart is just not that simple. If Jupiter was in a t-square or a grand square would you want to move where Jupiter was on an angle? Let’s say that you natally have a trine between Jupiter and the Sun. 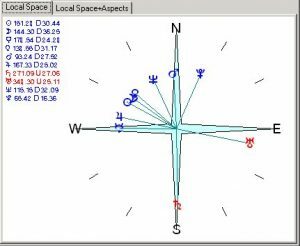 You would want to move where the Sun is in the second house trining Jupiter in the sixth house, and trining the Midheaven or vice versa. Well, you can find these places on the map with our LOCALITY MAPS program. Now you have the makings for real financial success! That’s certainly better than moving based on your Jupiter line alone … don’t you agree? 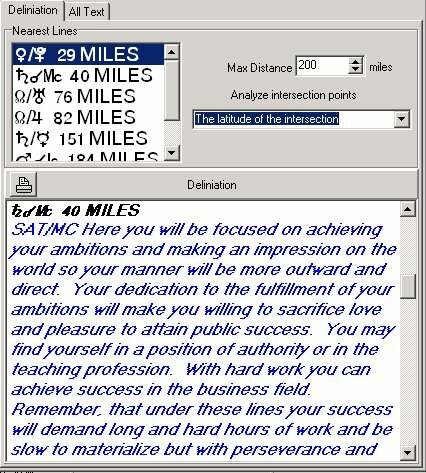 It calculates any where in the world where there is a maximum strength for career, love, education,etc. AIR Software we believe that there is more to Astro Mapping techniques than just moving under a single planetary line. Using specific techniques and unique models, Locality Maps calculates where the chart holds maximum strength for career, love, travel and etc., for anywhere in the world using all the energy in the natal chart. Would you base your client’s personality on only one aspect or planetary placement? Of course not. The same principle applies to Astro Mapping and moving under only one energy does not work. This technique paints areas and regions in the world where these combinations of energies are at the highest – not just a single line. Let’s say that you were born with strong Jupiter would you want to know where on the planet that Jupiter is in your 2nd house for money, 3rd house for writing, 4th house for living ETC. Our LOCALITY MAPS allows you to do just that and much, much more. Make any of your own models and it will display on a map where these models are the most powerful. At a glance you can see the patterns displayed! This gives you all kinds of possibilities as the sky is the limit. PRINTING THE MAPS: You can print any map with all the lines and eclipse paths, save it on disk as a bmp or send it to a clipboard to paste it in any written work. You can make a tax deductible donation to IAA by December 31st using a credit card or your PayPal account. All material at this website is copyright © 1997-2019 by OCA, Corp. All rights reserved. Reproduction without written permission is prohibited. The IAA logo is copyright © 2015 OCA, Corp. "International Academy of Astrology" is a trademark of OCA, Corp.